After I Went Through Trying To Turn The Switch Off, Would Only Turn To Acc, Then I Turned It Back To On, Held The Brake Pedal Down, Moved The Shift Down & Back Up Several Times, Try To Turn Switch off (Only Goes To Acc & Sometimes After Repeating This Many Times, It Would Finally Go To OFF & Finally The Fob Could Be Removed. Then, Day Before Yesterday, My Wife Went To The Store, Managed To Get The Switch Off and when she came back out, the switch would not turn on! I went and picked them up that night and we went back yesterday morning and upon advice from a friend, disconnected the battery cables, held them together for about 30 seconds and the switch released. we brought it home and then, could not turn the switch off, once again. And just for the heck of it, I removed the little key from the fob and the switch released the fob. now, it seems like the switch is the problem, the best I can figure out. So, I Look it up on O'Reilly's, Autozone & Rock Auto & They All Showed The Same Part, BUT, When I called O'Reilly's & gave them the info, I was told that that part was not for a 2008. I even went and checked Advance Auto Parts & got the same info. My 1st question is, has anyone else had this issue with the switch? My 2nd question is, am I on the right track, concerning what I need and if so, why is there the issue of the part number not being for a 2008, when I find the same thing at all of those places? Any input would be Most grateful to receive. Thank you, in advance. I need to find out where the ignition switch gets it's signal from, that allows it to be turned off. That should tell me what I need to do. Anyone Know Where The Shift Interlock Is, On The 2008 Town & Country? That just might be the source of my problem. Just need to figure out where it is & test it. 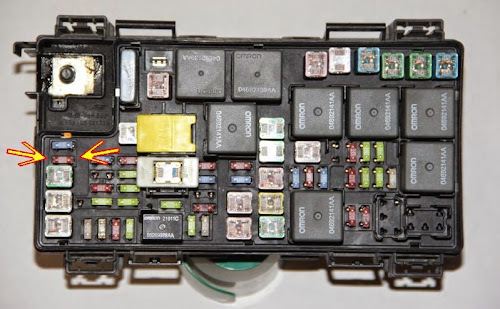 Until you get this repaired, the author of the above linked article says you can get the key to release by removing then reinserting the 10 amp fuse (M27) that powers the WIN (Wireless Control Module) aka Ignition Switch. Removing the fuse will reset the WIN module and may allow the WIN to function correctly. I have included a picture of my TIPM showing the location of the 10 amp fuse (red). Thank you, georgef, certainly will check that out. Appreciate it. I will post up how it goes and what the outcome is. I have to wonder, if there could be a problem, IF that fuse was left out, until the issue was taken care of? IF, that fuse doesn't involve anything else, then maybe it could be removed and made it easier on us, until I could get the switch problem taken care of. Well, I answered my own question. No, it can not be started, without that fuse. But, it looks like I have to get a shifter. Too bad you can't just get the switch. Well, Now I Have Done It. I decided to go ahead and order a Shifter, as it seems the switch that is built into the shifter, is the problem. So I ordered one, got it in today. Then, I proceeded to get to where I could swap out the shifter. I was going by The Instructions from the guy who had posted this. I had trouble trying to pop loose the Top 2 pieces of the dash and could not seem to get them to come loose. So, I decided to see if I could get the shifter swapped out, with them in place. I remembered the guy saying he broke the piece that held the cable housing in place, so I was careful about that and ended up breaking the socket end that pops onto the ball on the shifter! So now, I don't see that I have any choice, but to buy a shift cable. I tried to find a shift cable somewhere so I could see about how much That will set me back and can't find one anywhere. Even found a Mopar Parts online, but it isn't working right (could be it only works, during business hours?). I saw some kind of replacement piece for shift cables, but I don't think it is for the end I need. What a development! I am tired! Anyone have any suggestions? I am all ears. Okay, I have a cable ordered, through my local Mopar Dealer & is supposed to be here tomorrow. So, Then I get to get back on putting this back together. So, I had managed to break the piece of the cable that attaches the cable to the shifter. And, as luck would have it, the cable had to be ordered through the Dealer & I did order it and it came in Saturday. And I started back on the Town & Country. Now, when I got the new cable ( I had been told that there was a lot of improvement made on it, over time. SO, I put the new cable on and tried it out, finding that I could shift into every gear, except Drive. Now, I haven't ever had to replace this cable before and I have had several Grand Caravans, over the years, but, they were a new 1993, a used 1993 LE and a New 2006. I put over 100,000 miles on each one. Anyway, I had not manual and could not seem to find anything online, but wondered if there was some kind of adjustment. So, I finally bought a Chilton's from O'Reilly's (I had been intending to, all along and just never got it done. And it mentioned adjusting the cable. The old cable required a screwdriver (Crosstip, I believe), but I remembered this new cable had a small nylon wire tie included. So, I removed this white piece from the cable (the wire tie was under it and then realized that I was to remove the white piece, push the end of the cable (that attaches to the shift arm on the transaxle)back toward the firewall, put the white piece in place on the cable and secure it with the wire tie. I did that and problem solved. Now, on to the headlight problem, in my other post. Thank you, for the input here, Sure is good to get issues taken care of. I have never had near as many, as I have had with the 2008 (bought it used & it is seeming like whoever had it before, left me with a lot of things to take care of. Help! - '04 Pac. - Can't turn ignition switch - AGAIN! Quick Reply: Started Out, That Ignition Switch Would Not Turn Off.